With the dining room out of the way, next logical scavenger hunt giveaway stop is exploring the damage my loving family has done to my kitchen pieces. It's simply amazing to me what the dears can do, inadvertently. Although our counter top microwave was replaced with an over the range convection oven combo some time ago, I still have a microwave stand that is in regular use. It's now home to both our tupperware in the lower storage area and family communication center above, with key bowl, activity calendar and the like. Even though it's an older piece, it is yet in great condition...except for one minor, irritating point. Can you guess? Those of the dining chair abuser crew cannot seem to be able to retrieve any plastic storage containers from it without leaning on the open doors. Despite sheepish efforts by my husband to adjust and replace the door hinges, the doors simply refuse to shut completely anymore. This minor thing drives me crazy, every time I'm in the kitchen! With that in mind, our hunt leads us to Cymax's Morekitchencarts.com to see what they have to offer in the way of Microwave Carts and Kitchen Carts. I need storage below and actually have a good size piece to replace. 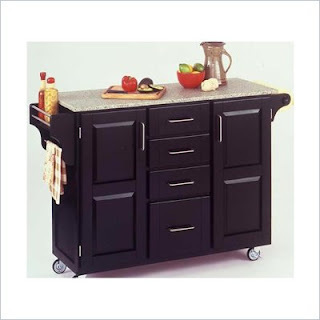 I am seriously considering this Home Styles model, with granite top and adjustable interior shelves, four utensils drawers and side spice rack! Although it is shipped ready to assemble, the construction is solid hardwood. Choose from Cherry, Black, Natural Wood or White finishes and either black or salt & pepper granite tops, as well as an Oak finish model with grey granite. Best of all, Cymax is offering free shipping, at least through May 9th, and it's on sale, 43% off! What a steal! This particular model also comes in a smaller size and on casters, which I love, for cleaning. 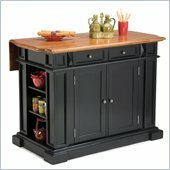 There are other Homestyle kitchen islands that are very similar, but offer solid bases, like this Kitchen Island with folding breakfast bar. With a black finish and Cottage Oak top, (and doors that close!) it would certainly be a welcome replacement for my existing abused cart! Tell me in a comment below some of the unexpected things your family has done to your furniture and your favorite kitchen cart from Cymax! Thank you to Cymax for sponsoring this introduction. The opinions above are both honest and my own. The Scavenger Hunt giveaway is sponsored by CymaxStores.com and That's What She Said. Really nice items on that site! The one that I liked is Home Styles Furniture Kitchen Island Cart in White. I like Home Styles Furniture Granite Kitchen Island Cart in Cherry, savings of $275.41 do not hurt one bit! Boyfriend placed a bag with oranges on an upholstered chair, left a stain. The stain was not unexpected, but his leaving the bag there was! Nothing too unexpected - lots of rips, stains, tears, scratches and even paint drips from when we were painting our new-to-us home a few years ago! My daughter colored on our new dining room table we had bought off craigslist, with permanent sharpie marker about a week after buying it :/ I love the Home Styles Furniture Kitchen Island Cart in Natural Finish and I could save $252.73 (42%)!